Alcher Interiors New Product Discounts – 5/11-5/25 | Alcher Interiors, Inc. Tons of cool new products will be arriving all Spring and Summer. As they come in, we’ll be offering them at 20% for a two-week introductory price. New styles, palettes and designs keep coming in, so make sure to stop in and check out some of the latest in home decor and design. We have two new fabrics from Schumacher: Watou Herringbone and Beaufort chenille. Both of them are perfect for completing the look. Use them for upholstery, some super-yummy large floor pillows, or upholstered valances. Make sure to stop by soon to qualify for the discount! Also new is the stunning Summer Sand wool carpet by Antrim. The soft heathered plush will look great as either an area rug or wall-to-wall carpeting. Trying to Keep it Neutral? Just in from Jeffrey Court are beautiful pillowed clear glass tiles (4 x 8) – perfect for back splashes or bathroom walls. In fact, it’s perfect for jazzing up a classic tile look with a modern accent. 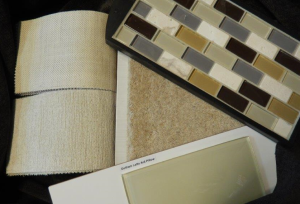 It pairs beautifully with Jeffrey Courts 1 x 2 clear glass and stone mosaics – also perfect for a back splash! We also have Thorndike Mills on sale (“Refresh Your Home Sale,” Thorndike braided rugs – Vineyard Haven, 15% off May 1 thru June 12th). And Hunter Douglas is offering a $100 rebate along with a free Ultra Glide 2 click and walk-away upgrade on Silhouette and Nantucket through June 30th. (Learn more on our Sale page). Fresh designs and palettes will keep arriving from the biggest names in home decor and design, so check back for new two-week specials!